Here is a free Spanish color by numbers activity. 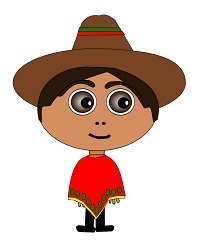 Download and print out the file, then have your children or students color the picture of the girl in the sombrero according to the color scheme indicated on the worksheet using crayons or colored pencils. And the number zero is: Cero. 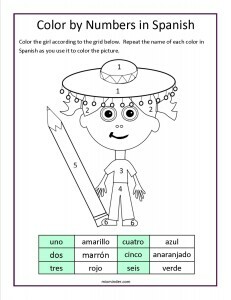 When using the Spanish color by numbers worksheet, it is a good idea to have your children or students repeat the Spanish names of the words they are coloring while they are completing the activity page. This helps to reinforce the translations, and to get the Spanish names of the colors “into their heads” while they are looking at the actual colors on the worksheets. Thanks for the feedback! We will be working on several other language worksheets for French, Spanish and perhaps other languages as well. Would you have any suggestions for worksheets that you’d like to see? We could certainly make some more color by numbers worksheets. Thanks for your feedback, and all the best to you.